do you require a closing clasp? do you require a closing clasp? (required)No clasp Thanks.Yes, one that matches the main leather colour.Yes, a red one.Yes, a navy blue one.Yes , am Ochre one.Yes, a Yew green one. do you require a closing clasp? (required)No clasp Thanks.Yes, one that matches the main leather colour.Yes, a red one.Yes, a navy blue one.Yes , am Ochre one.Yes, a Yew green one. do you require a closing clasp? (required)No clasp Thanks.Yes, one that matches the main leather colour.Yes, a red one.Yes, a navy blue one.Yes , am Ochre one.Yes, a Yew green one. do you require a closing clasp? (required)No clasp Thanks.Yes, one that matches the main leather colour.Yes, a red one.Yes, a navy blue one.Yes , am Ochre one.Yes, a Yew green one. personalisation text required - ensure correct payment is chosen to avoid delay. include a presentation gift box include a presentation gift box (required)Yes please! (+ £4.75)No thanks. include a presentation gift box (required)Yes please! (+ $8.63)No thanks. include a presentation gift box (required)Yes please! (+ €5.60)No thanks. include a presentation gift box (required)Yes please! (+ $6.89)No thanks. gift wrapping options gift wrapping options (required)Gift wrap ONLY (+ £3.25)Gift wrap with extra message tag (+ £4.50)No Gift wrap thanks. gift wrapping options (required)Gift wrap ONLY (+ $5.90)Gift wrap with extra message tag (+ $8.17)No Gift wrap thanks. gift wrapping options (required)Gift wrap ONLY (+ €3.83)Gift wrap with extra message tag (+ €5.31)No Gift wrap thanks. gift wrapping options (required)Gift wrap ONLY (+ $4.71)Gift wrap with extra message tag (+ $6.52)No Gift wrap thanks. 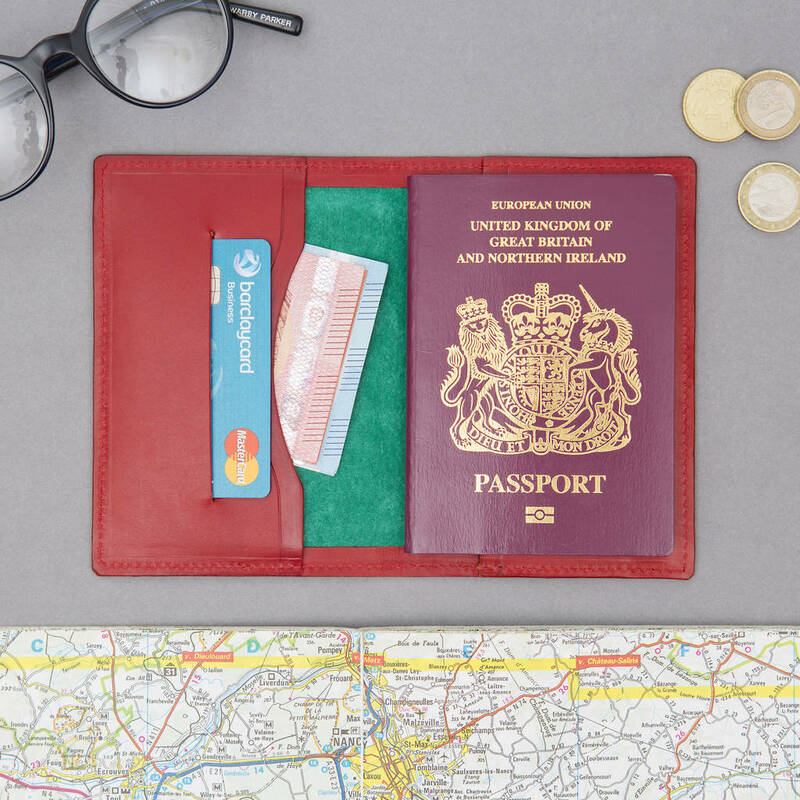 A luxury lightweight travel wallet and passport holder in bright colourful leather, to hold travel documents, cash and cards. This bright leather passport holder will hold most modern passports of a similar size and is ideally suited to a standard thickness British European Union sized passport (12.5cm x 90cm) or equivilant. 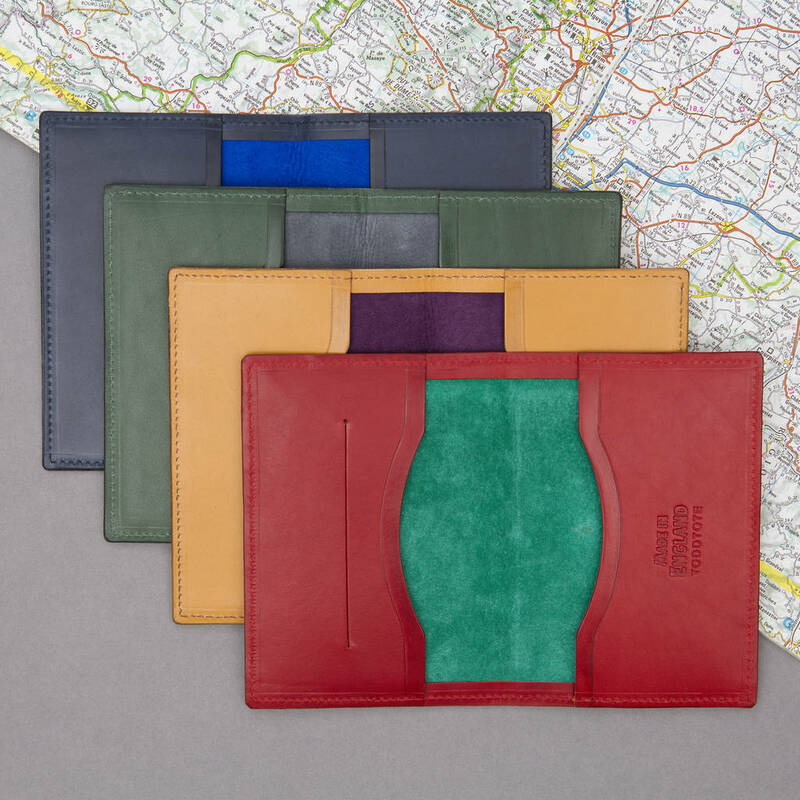 These fun made-to-order travel wallets will appeal to most people ,especially the young at heart traveller and make an excellent gift for gap year travels or summer holidays. 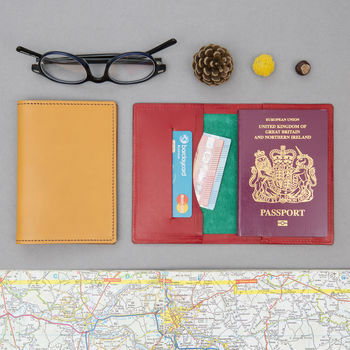 This Passport wallet is carefully made to your specification in our Heart of England workshop. This passport wallet has been designed so that just the stiff back page of the passport is inserted into the pocket, as shown in the images. This is for ease and quickness of removal at customs/passport control. The entire passport will not fit into the sleave compartment. Please see our Super Deluxe Passport wallet if you want a larger model. The front cover of the holder can have a choice of letters and numbers embossed onto the leather and can also be made without any lettering. Extra text can also be added to the inside lefthand flap of the item. The choice of lettering is between non-serif HELVETICA 18pt font, or our antique bookbinding branding tools. The antique bookbinding branding tools are individually hand-stamped onto the leather and impart a lovely quirky quality to the text, that is not achievable with mass-produced items. All letters in this style are a mixture of different styles & scales of fonts. They are all uppercase and are applied individually by hand to the leather. (Please note that due to the hand-stamped nature of this service, character placement and spacing will vary and be of an 'organic' nature - see images). Maximum quantity of letters/characters for this option is 80 - PLEASE ENSURE THE CORRECT PAYMENT OPTIONS FOR TEXT QUANTITY IS SELECTED to avoid any delay. Although we highly recommend the use of our antique bookbinding 'blocking' tools to apply any letters and words, we also have an ordinary non-serif HELVETICA 18pt font. Personalisation is with a name or monogram in the non-serif HELVETICA 18pt font, plus numbers. Other personalisation can be added as a simple monogram to the inside front flap of the holder. Luxury Tuscan saddlery leather and suede. This is a new travel wallet design for 2017 and is currently available in outer colour options of Red, Navy Blue, Yew Green, and Ochre coloured Italian/Tuscan leather, with a choice of 17 interior suede linings, giving almost 80 separate vibrant combinations from which to choose. It can also be made without a suede lining too. The unlined version will show the reverse side of the main outer leather in the interior of the wallet instead of a colour suede. 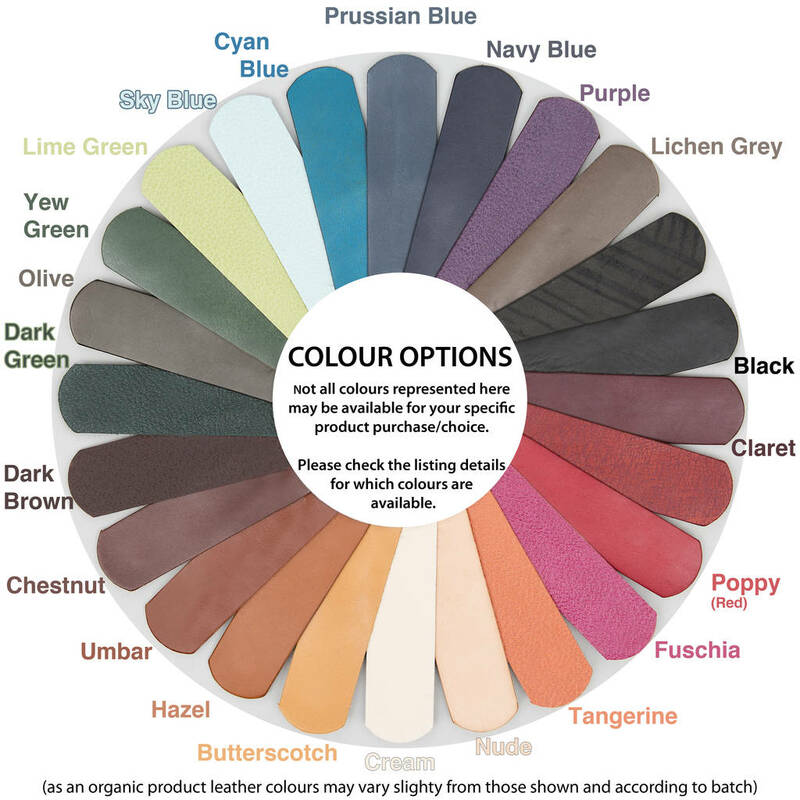 Please note: As an organic material, leather has unique features and textures called ‘the grain’ of the leather. We use only the highest quality leather, and prioritise making your order to the very highest standards, resembling, as closely as possible, the images shown in the product listing. There may however, be variations (tone and texture) and unique characteristics inherent in the leather from batch to batch. 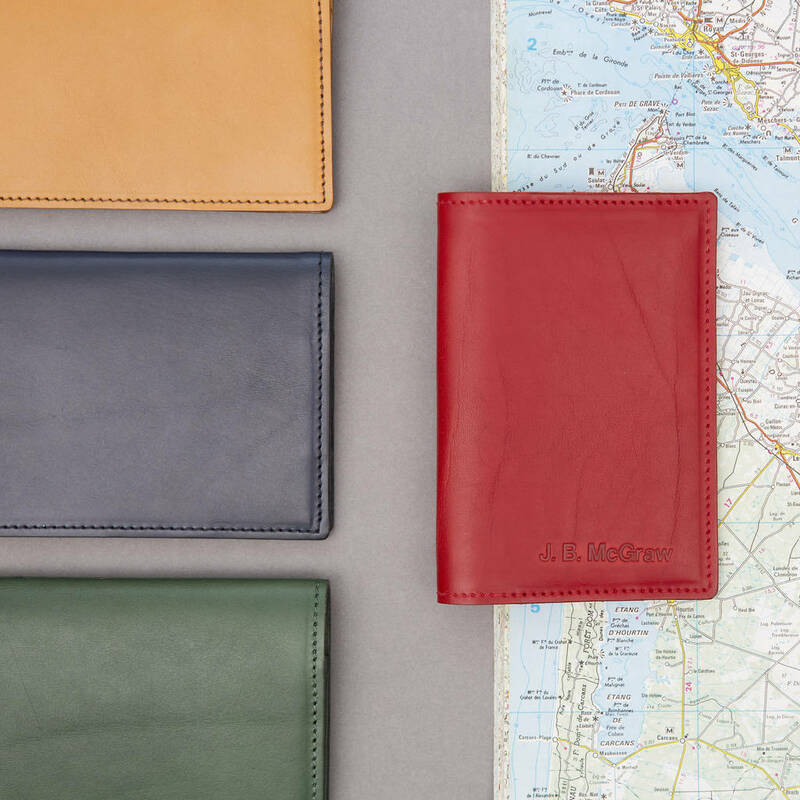 Current leather colour options for the main body of this version of the travel wallet are: Red,Ochre, Navy Blue and Yew Green. 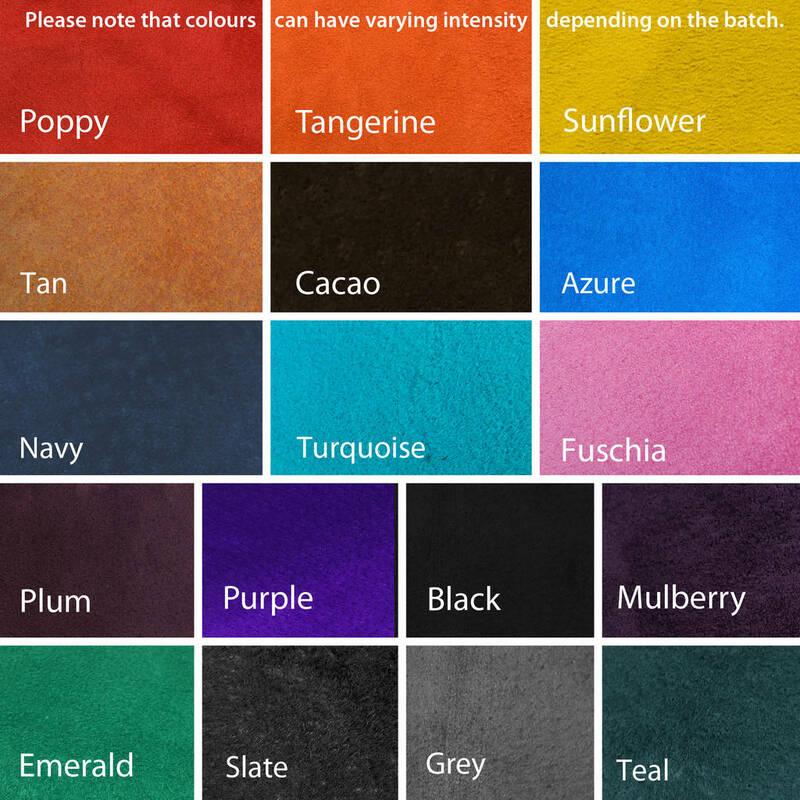 The choice of coloured suede linings are; Poppy, Tangerine, Sunflower, Tan, Cacao, Azure, Navy, Turquoise, Fuchsia, Plum, Purple, Black, Mulberry, Emerald, Slate, Grey, & Teal. To hold a standard thickness H12.5cm x W9cm British EU passport. To hold a standard thickness H12.5cm x W8.8cm British EU passport.